Lime is a high-energy group from the early 80s – Denis and Denyse Le Page – well known for the fantastic light-hearted love songs and dance anthems they created. Their 1986 album, “Take The Love” continuing on the electronic dance formula that wore feet out throughout the 80s and 2002. 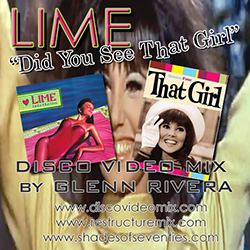 I have taken the track “Did You See That Girl?” from the “Take The Love” project and blended it with the 1966 television sitcom, “That Girl” starring Marlo Thomas and Ted Bessell – using the backdrop of the aspiring actress with the fun-loving high energy song. Featuring scenes from “That Girl” – RENT THE DVD!